Good morning! 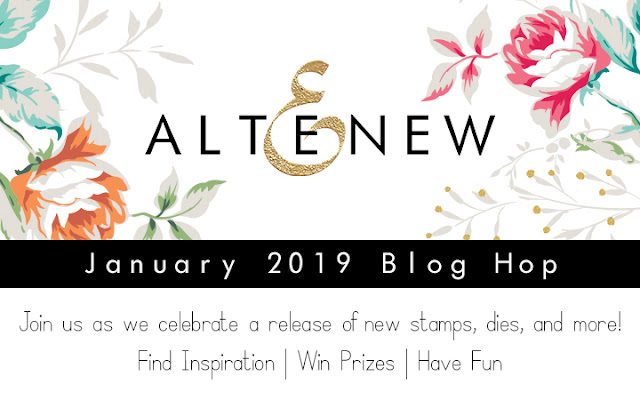 I can't tell you how delighted I am this morning to be hopping along with Altenew to celebrate the BRAND NEW January 2019 Release! You may have seen this release at Creativation this past weekend, or in photos from those who attended - and I can tell you it is just as beautiful as you might imagine! You can find the entire release HERE. So - fair warning - this is a VERY photo heavy post! I have a total of 7 cards to share, so make sure to get all the way to the bottom for the giveaway info! So I'm starting off with a card using one of my favorite items from the new release - Garden Picks 3D Dies! 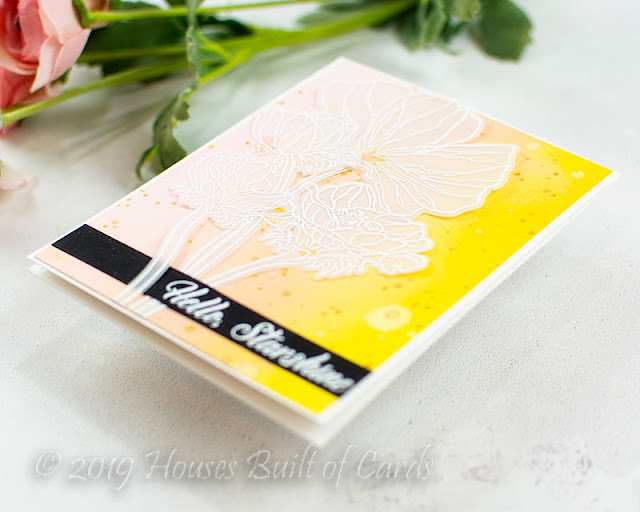 I love all of Altenew's layered floral stamp images - so adding it in a 3D option has been something I loved from the first set I saw! These are just as gorgeous as I would have hoped, and really quite easy and fun to layer as well! There is also a bit of soft stenciling in the background behind the flowers - do you see it there? I used Elegant Swirls Stencil and Morning Frost Ink. 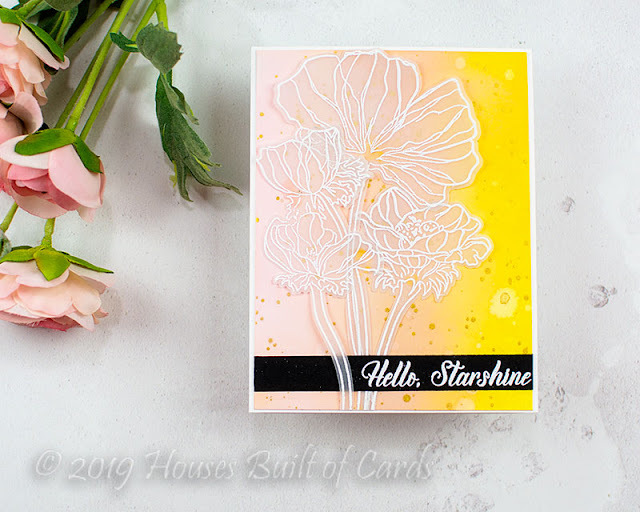 I used varying tones of cardstock to die cut the layers and build the flowers, then planned my placement and picked them up with some Press and Seal while I prepared the background. I was then able to press it into place quite easily after applying adhesive to the back of each die cut piece. Finally, I added the sentiment from Beautiful Blossoms using Moon Rock ink. Aren't those flowers stunning?!?!? 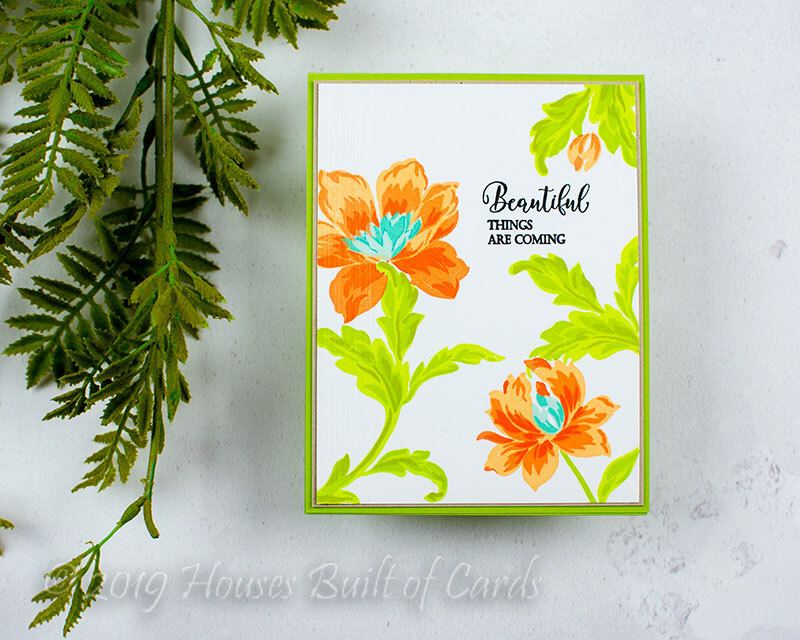 And speaking of stunning florals - how can you not fall in love with these beauties from the new Wonderland stamp set?!?!? 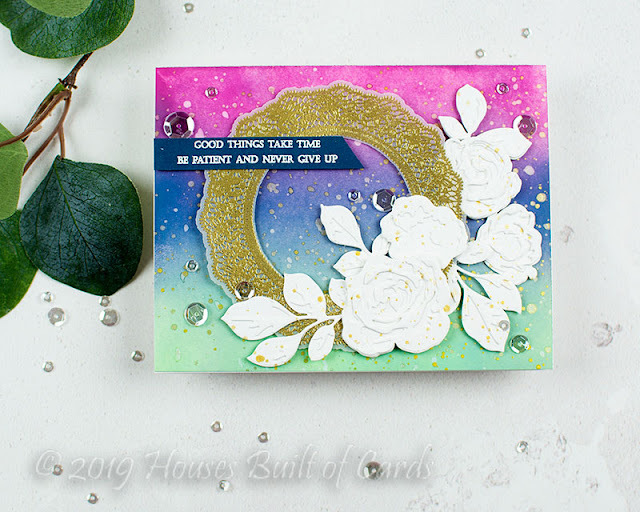 For this dreamy card, I used an ink blended background that I created with Distress Oxide inks and splattered with gold. I heat embossed the florals from Wonderland in white on vellum, then die cut with the coordinating Wonderland Dies. I layered them on my card, using tiny dots of sturdy liquid adhesive to hold them in place - which works perfectly, since you don't see those tiny dots! Finally, I heat embossed a sentiment from Wonderland stamp set on a strip of black cardstock, and tucked it under one of the stems, adhering it in place! And then, because I loved this set so much, I used it again, this time paired up with the clever new Wonderland Mask Stencils! I started off by stamping all my images on a panel of white cardstock. Then comes the fun part! These stencils are so clever! They are thinner than ordinary stencils, and include both the negative and positive die cut! 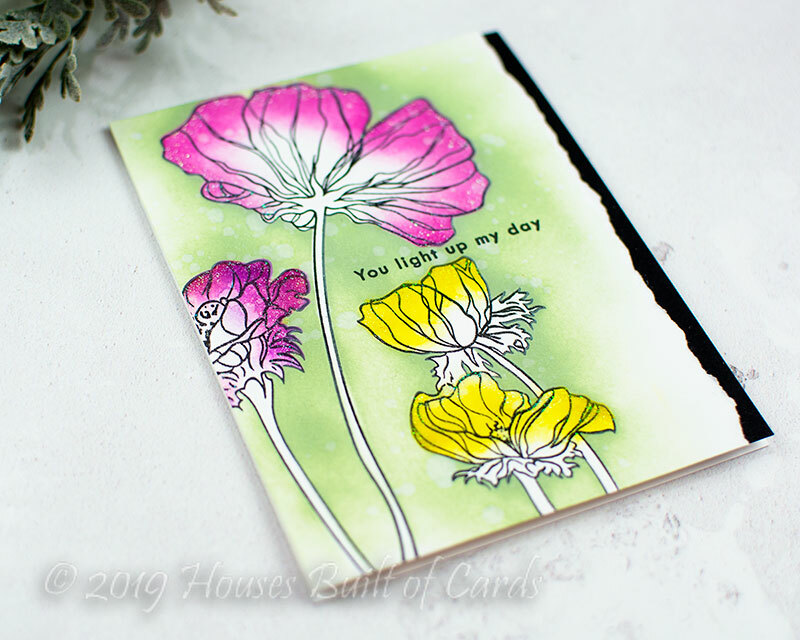 I used the main stencil to lay over the stamped images, and then carefully did a bit of ink blending over the outer edges of the petals in 3 different colors of distress oxide inks. Next, I layered up the negative pieces of the stencils over the images - holding in place with a bit of removable adhesive - and blended some ink around the edges of the flowers and added some flicks of water before removing the masks. So fun! Finally, I added a bit of sparkle with some clear glitter Nuvo drops - squeezing them around the edges of the flowers, and then smearing inward with my finger tips for a lightly frosted edge to each one, and stamped the sentiment in place as well - before tearing the right edge for texture and layering over a bit of black cardstock. And carrying on my seeming love of ink blending - next up we have this card that uses several of the new release items! 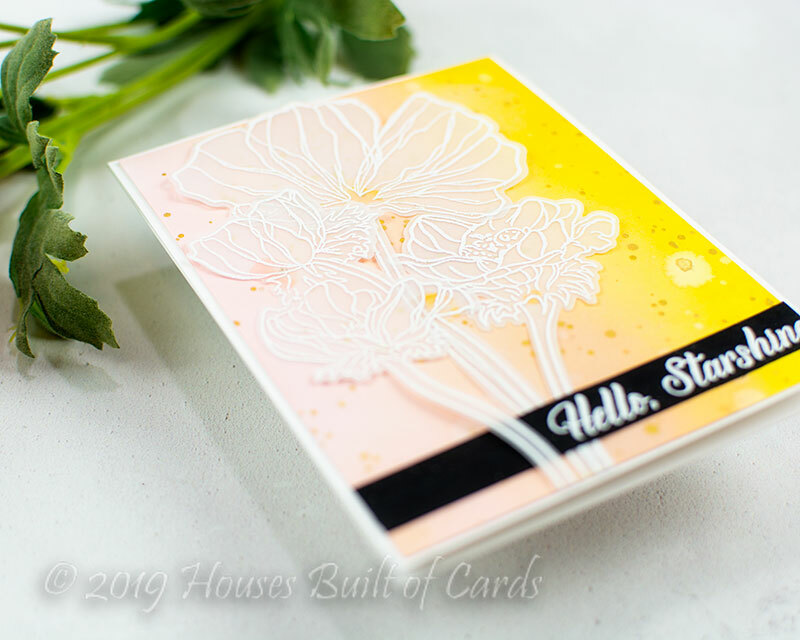 I thought it would be fun to use that lovely Garden Picks 3D Die with all white layers - I love the effect it gave! Such a different and elegant feel I think! I heat embossed the larger image from Fancy Frames in gold on vellum, and die cut with the coordinating Fancy Frames Dies - then layered that on my background along with a sentiment from Beautiful Blossoms that was heat embossed on a strip of navy cardstock. A splattering of gold over the entire top and a few sparkly clear sequins finish this card off! And again...another ink blended background! 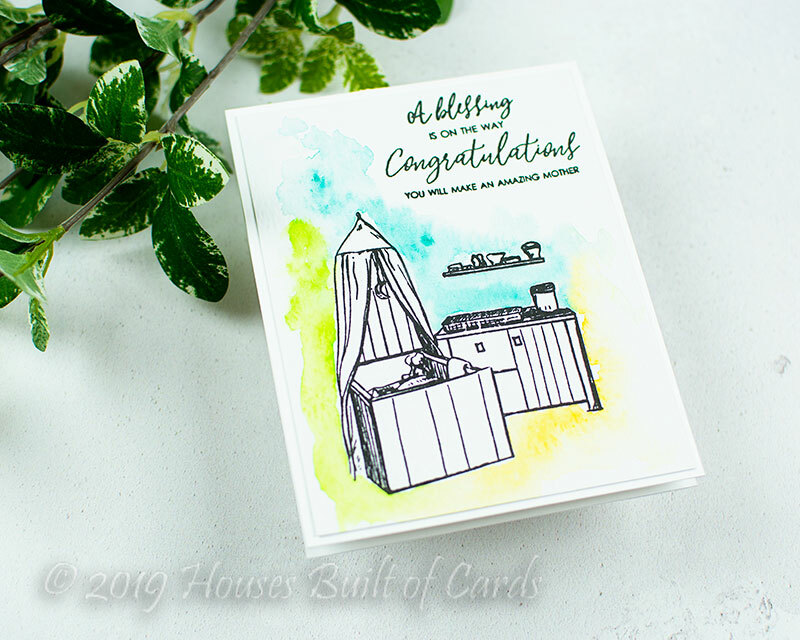 Some of these were from a trip to visit my friend Crystal Thompson in Wyoming, and some were created on a day I was having trouble focusing - but needless to say, I've been grateful to have them on hand, since they make it super easy to put together a card in a hurry! For this card I used mostly die cutting - with a simple sentiment stamped and heat embossed on a strip of black cardstock. I die cut the beautiful new Floral Heart Frame Die from white cardstock, and punched out most of the elements - leaving some of the smaller pieces in place. 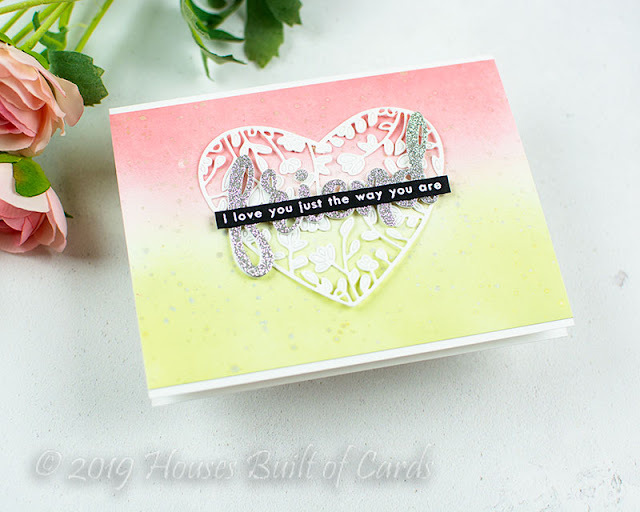 I die cut the lovely new Simply Friend die 3 times, once from silver glitter cardstock, and once from white cardstock, and layered them together for a nice dimensional sentiment. 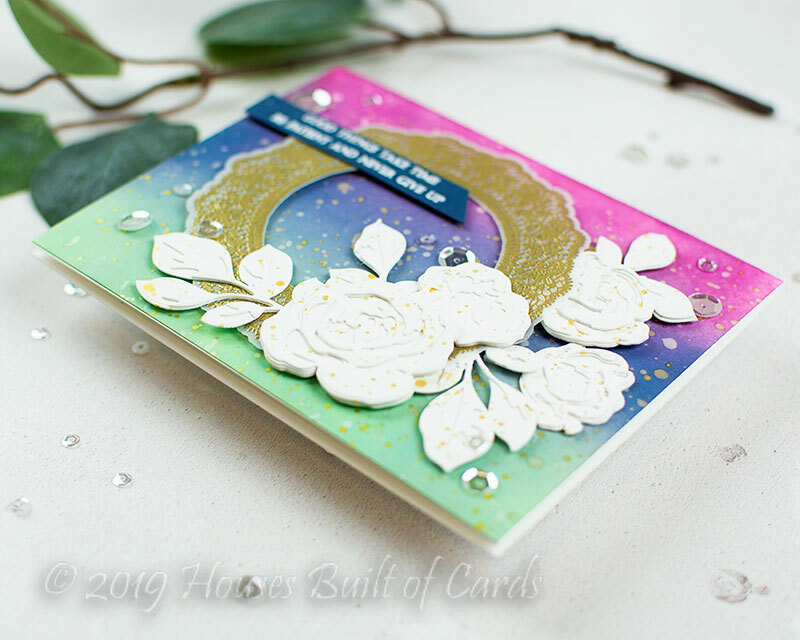 I adhered that to the Floral Heart Frame Die, then used that to hide my liquid adhesive just behind that large sentiment to adhere to my card. Love doing this with intricate dies, since it leaves the edges floating free and looks so elegant and dreamy! Finally, I added the heat embossed sentiment from Wonderland over the top. Check out the sparkle from some soft gold splatters on the background, and that lovely silver glitter cardstock! I promise we are nearing the end! So many beautiful cards with this release! 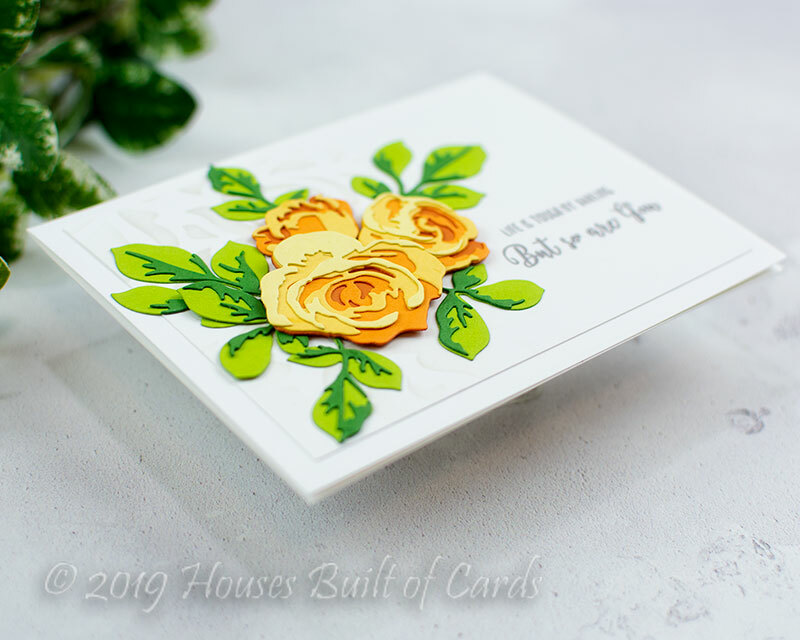 This card features the beautiful Angelique Motifs stamp set - another lovely layering set! I also used the handy Angelique Motifs Mask Stencil for this card - it allowed me to stamp and mask my images so easily! For a bit of interest, I added 5 score lines down the left side - it's hard to see them in the photos, but it adds a nice touch of texture on the card, without adding any bulk or layers. 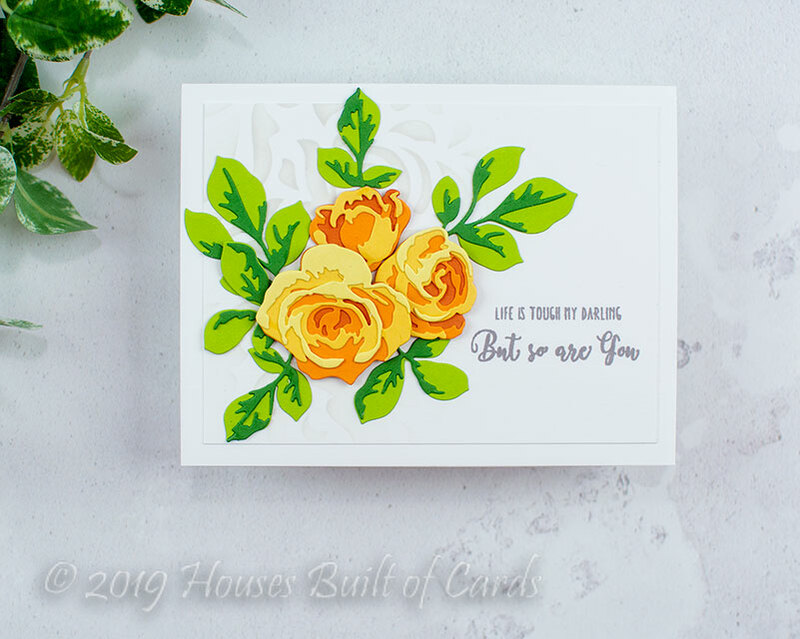 Finished off with a sentiment from Beautiful Blossoms (in case you can't tell - this set is loaded with great sentiments!) - and added a mat of kraft cardstock before mounting on a coordinating green card base. You've almost reached the end! I have one last simple card to share using the adorable new baby stamp set - Gift From Heaven! 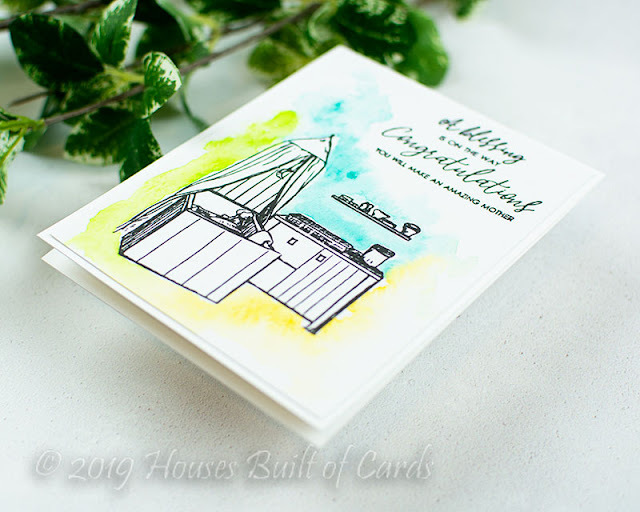 For this card, I stamped the lovely image on watercolor paper, along with a pairing of a few of the sentiments to build one large sentiment. I then did a bit of very simple watercoloring around the image to make it pop. I kept the colors very neutral, so this would easily work for either a boy or girl card! This style of card would be very easy to recreate in bulk for baby shower invitations or thank you cards as well! I would love to hear which set is at the top of your wish list - or which of these 7 cards is your favorite! I seriously had WAY too much FUN with this release! Altenew is giving away 6 $50 gift cards for comments left on the Altenew Card Blog and Altenew Scrapbook Blog. Winners will be announced on the Altnew blogs on 2/3/19. In addition, I have a $30 gift card up for grabs for comments left just on my blog here! My winner will be announced 1/30/19 on my blog here! Wow your cards are very beautiful! Thanks for sharing your talent! love this release. stunning creations - I am so impressed!!! 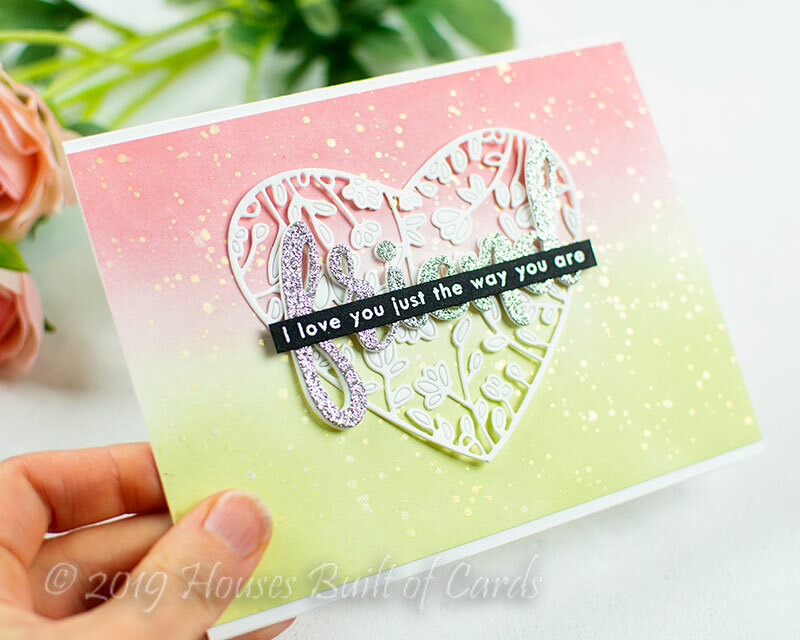 I especially love your first card with the soft background & stunning 3D die cuts! I love your "you light up my day" card, so simple yet elegant and pretty. Great cards! !, especially the 3D dies - stunning! 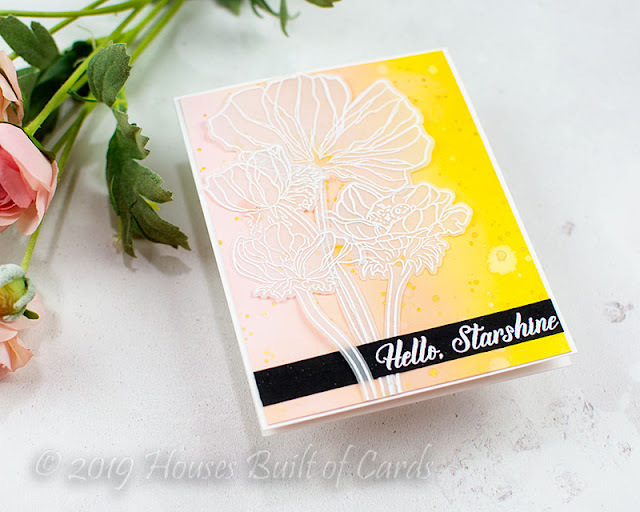 Wonderful cards, particularly the Hello Starshine pinks and yellows -- lovely! How beautiful is your card with the white embossed vellum - absolutely gorgeous Heather! GORGEOUS cards!! 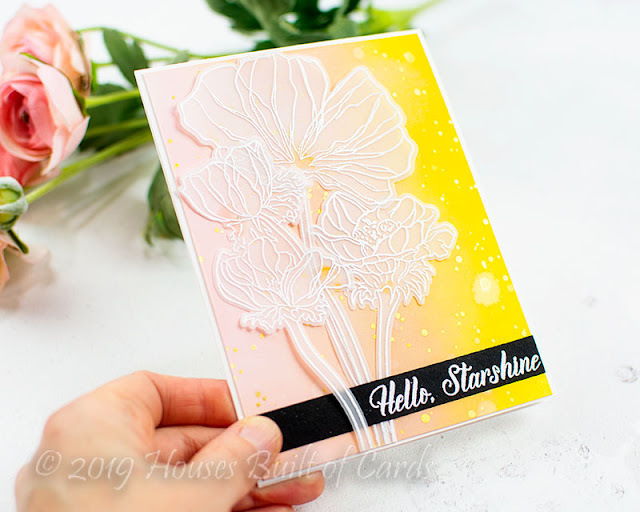 Love the vellum flowers on the stunning background with the Starshine sentiment! Makes me smile. Your backgrounds are lovely! Your cards are fantastic!! I love all the colors of the flowers, and your backgrounds! Thank you so much for sharing your talent, and inspiring!! This new release from Altenew is a great one! I love your last card with the all white flowers! Wonderful cards - I especially love the embossed vellum poppies and your lovely baby card - so elegant! So many gorgeous cards!! You have been busy. I love the jewel tones on the ink blended background and the white 3d flowers! It looks like it took forever to do! With each cards I thought "oh I will remember to comment on that one" but there were too many I liked. Thank you. Every time I think I have enough flower stamp sets, along comes a release like this one! Thanks for your wonderful cards. I think the Garden Picks die set is my favorite. *picks jaw up from the floor* your creativity is a pleasure to witness! You've used a variety of items from the new release, and they are a quite beautiful! The yellow flowers you made using the 3D dies is so sweet, they remind me of a my best friend 😍😍😍 lovely work! Really sweet cards. I loved all the color combos you used. Especially the baby card. you weren't kidding about getting carried away! Love each and every single one of them!!!! Your cards are beautiful. 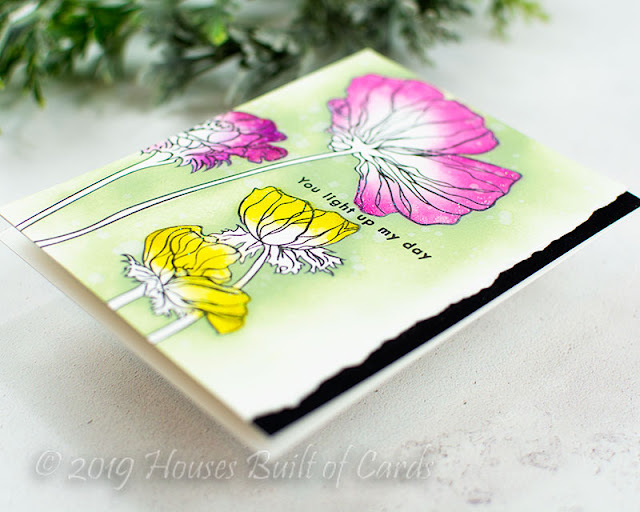 I have two favorites Garden Picks 3D and the Wonderland - love how you used the vellum - Beautiful! I love the bright yellow ones the most! This release is fabulous and you really showed so much variety with what we can do with it! Beautiful cards! Love, love, love!! All your designs are very pretty Heather, you did a fantastic job showcasing the new products! Thanks for all the wonderful inspiration ! Oh my gosh these are so pretty! 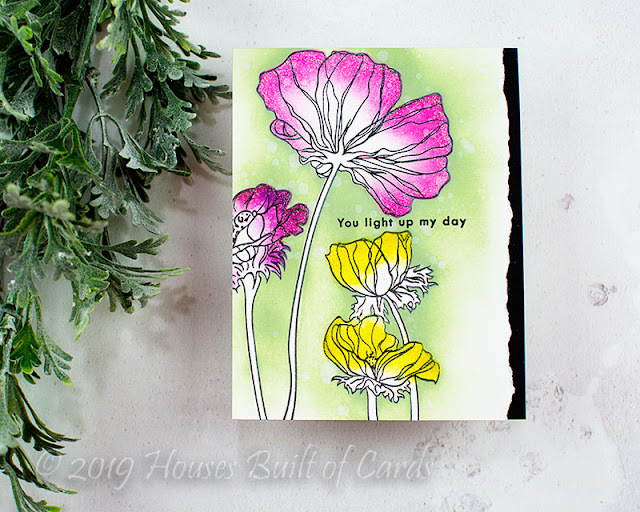 Beautiful cards.....what a fun new release...thank you so much for sharing your lovely cards today. What a lovely array of cards--all different and beautifully crafted! I love your cards, especially the ones with yellow. I also loved the vellum. Time to stamp with that vellum again. Thanks for sharing. beautiful products and projects. thank as always for sharing. The Beautiful Blossom car is absolutely stunning. The other cards are also beautiful. Beautiful projects, Heather! Your flowers are gorgeous. Love the magnolia hearts and the adorable baby card. Wow...what a great variety of cards! I can't wait to try using some of these new sets to start creating new projects. 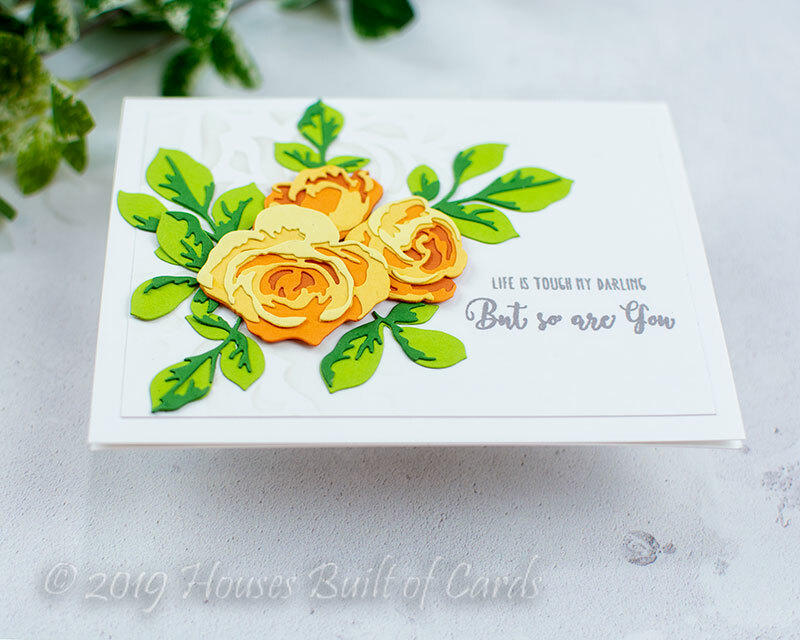 I am so in love with those layered flowers and I love them in the yellows! Hi Heather! Your cards are amazing and I really appreciate what you're doing with your blog and paper crafting business :) Thanks for the inspiration!!! Wow... beautiful cards, love every single one of it! Your designs are amazing! Beautiful card designs. You created so many examples using the new Altenew product line that I have plenty of inspiration to begin creating one of my own. Thanks! Heather, I bet you had a wonderful time creating these! They're beautiful! I'm loving the 3D dies! Heather your cards are all just gorgeous! 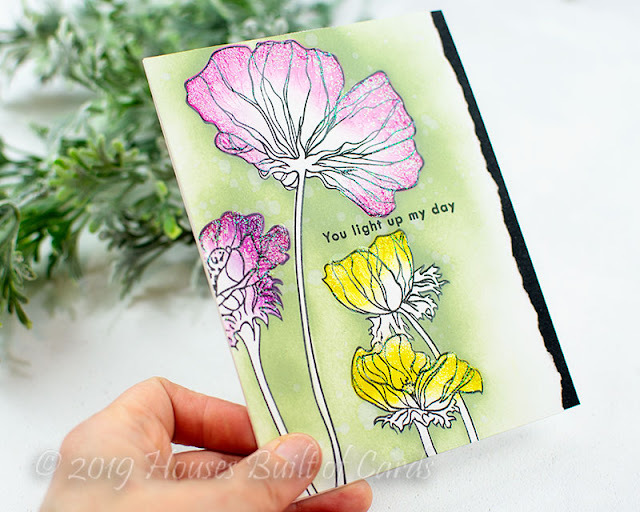 I love the beautiful vellum flowers on your bright happy background! Thanks so much for sharing and inspiring us! All the cards are beautiful. My favorite is the 3D. Such beautiful cards, thanks for the inspiration! One beautiful card after the next! My fave is the white embossed Wonderland card. The Hello Sunshine card is my favorite. 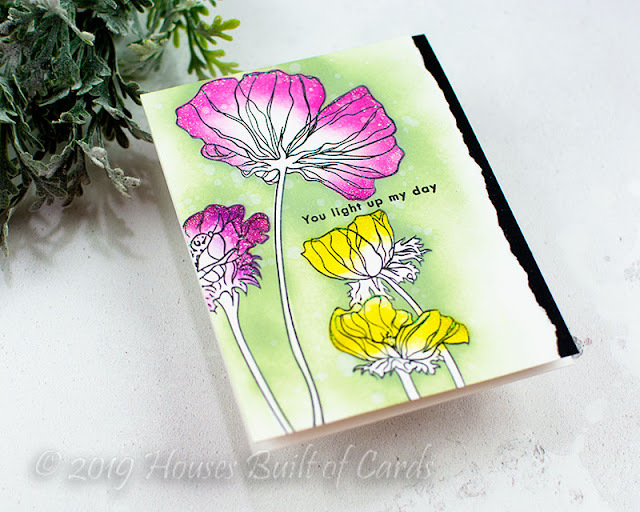 I love the way you used the vellum flowers! Nice choice of colors. I love the 3D flowers. 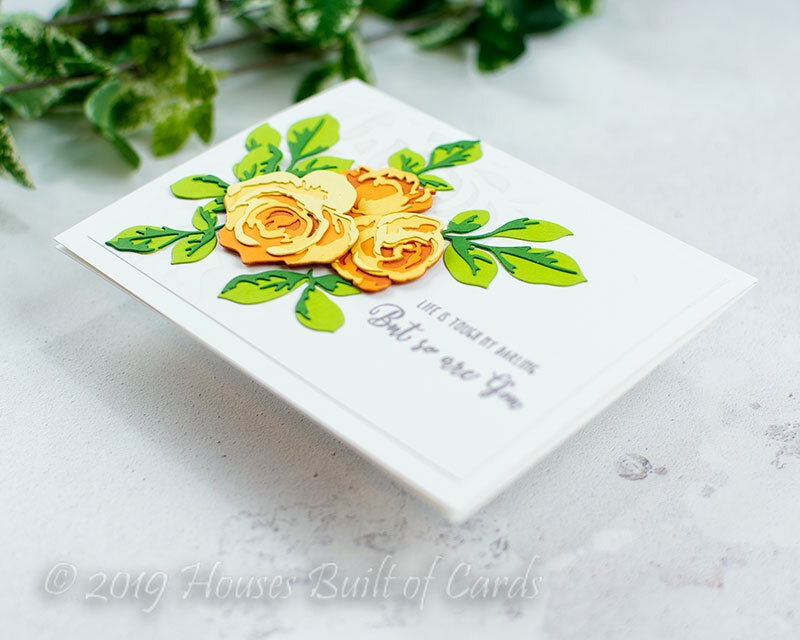 The 3D dies are my favorite from this release and I love the first card you made using them. All of your cards are gorgeous, though!! So many lovely cards and my favorite is that Garden Picks 3D Die Set! Awesome Release! Great projects, I especially love both Wonderland cards! So many amazing projects, I love all the colour explosions! Your cards are awesome. I am loving the Wonderland image. Great colors and pretty stamps/dies/stencils. All your cards are beautiful but my favorites are the Wonderland on vellum and the Angelique Motif in oranges. I love oranges but we never see cards made with those colors much. Wonderfully done. Wow, you were busy busy busy making beautiful cards! Love them all. Thank you for sharing you talents!! Love all your creations they are all so unique .. my favorite is the fancy frame with 3d flower..
Can tell you had fun with this release! I think Wonderland is pretty darn Wonderful. So many completely different looks, love this! Really beautiful cards! Great inspiration. Really beautiful colors for all your cards. Love the look of them and the layout you chose to do. Great job. Beautiful cards! 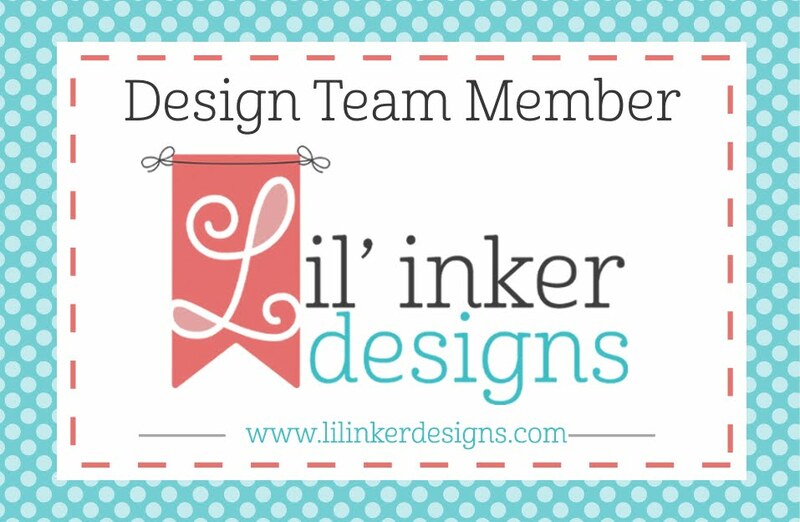 I love the 3D flower dies and the Wonderland flower stamp set. First off Heather, is there such a thing as having too much fun stamping? If so then yes, you clearly were have a blast! These are all so gorgeous its hard to pick a fave although the first one is pretty special. I love the soft stenciling you did out around the flowers, a great touch. 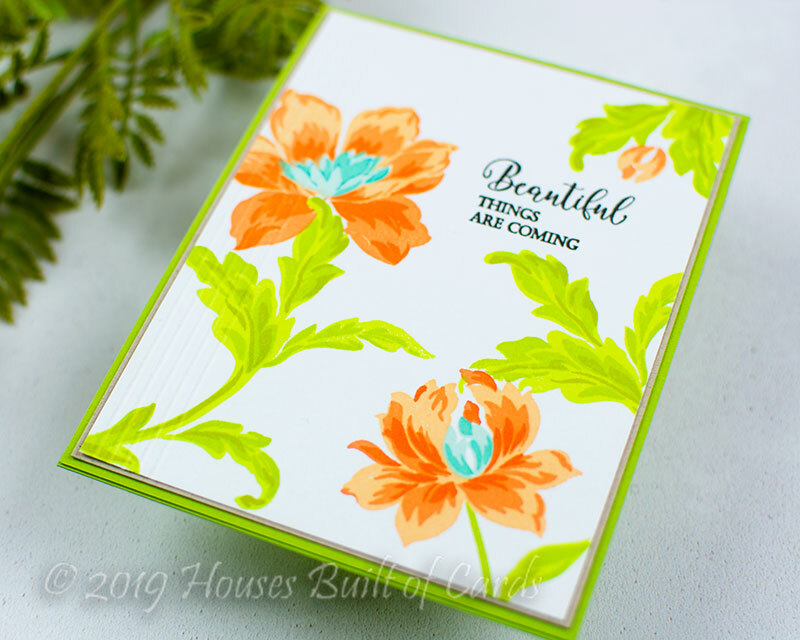 My fave sets are the Hibiscuc Garden 3D dies, Beautiful Blossoms, just to name two. .I am flabbergasted at your stunning creations. I too love how you used all white layers with the Garden Picks 3-D dies (that set is on my wishlist). Thank you for sharing your amazing talent. I love the wonderland mask set and how you used both the negative and positive die cut. All your cards are very dynamic. So lovely. Thanks for sharing! Awesome cards, thanks for inspiration! Beautiful cards! I love the colours you used on the first card! 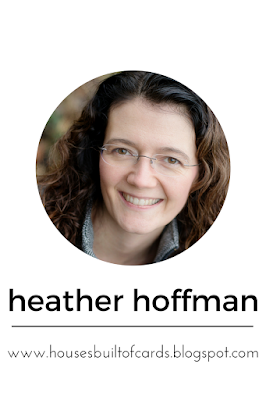 Heather, thank you for sharing your creativity. It truly inspires me. Also may God bless you for thinking about families that are in need. The world is a better place because of you. Gorgeous cards, they put the Wonderland flower set at the top of my list, so beautiful and elegant! I love all your ink blended backgrounds and color combos. Thanks for sharing your incredible talent. Very pretty variety of cards. My fave is the first one. This release is so unique and am in love with the inspiration you have shared!! The gold embossing on the vellum with the Fancy Frame is brilliant!! Love all of it! I just love this new release as well! The hearts, the Angelique flowers, and the 3D florals are all wonderful!Your card with the heart and the yellow Angelique card are my favorites! All are so pretty! Wow! You sure had fun with this release. I like all of your cards and will be trying some of your techniques when I get done "hopping"! Thank you. Beautiful cards! My fav is the first... using the garden dies. Stunning! and the blended color for the background. Beautiful cards, Heather. Love the soft stenciling on the first card. It really makes the flowers pop. And the second card is just magical! Absolutely adore the soft, dreamy background. The garden picks die card is so beautiful. The yellow flowers are amazing and I can't wait to try this out. I love all the colors you chose for your cards! Your cards are amazing. I love the Garden Picks 3D dies -- so many possibilities. Wonderful release. Wow!! Lot's of beautiful cards!! I especially love your yellow roses & would love to get that die set!! So many stunning cards on one page! Exquisite! This is a great new release, and you’ve done a wonderful job of showcasing some of the new goodies. Wow Heather, you've been busy! All of your creations are beautiful! You showed off a lot of this release! Thanks for all the inspiration! Gotta get my hands on those 3D Garden Picks dies! All your projects are so lovely! yellow roses are my favorite so I'm luvin' your first card! Thanks for sharing so many different cards! I think my favorites out of this release are the 3D die sets. Gorgeous cards! 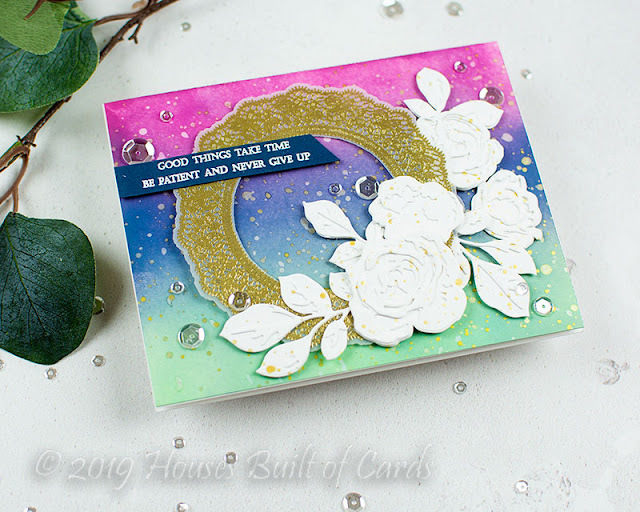 I really love the set of dies you used on your first card and the fabulous color combo! Your cards are all lovely but I especially love the white on vellum Wonderland florals. Gorgeous! TFS! Wow what beautiful creations!! 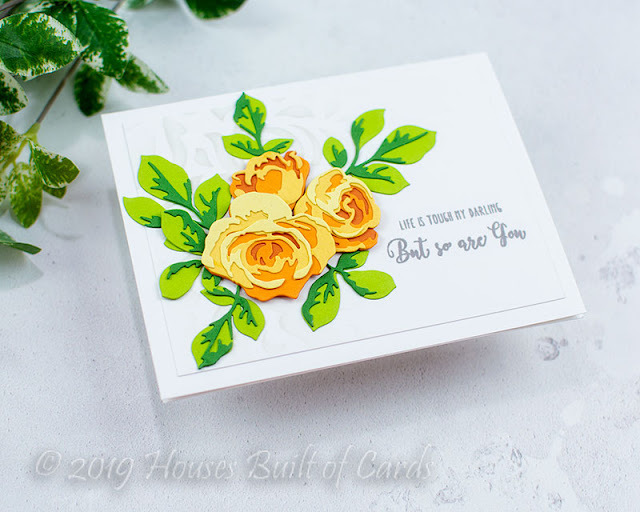 Love the yellow roses and the intricate heart! Lovely works of art! I love your first one with the 3D flowers and leaves--stunning! 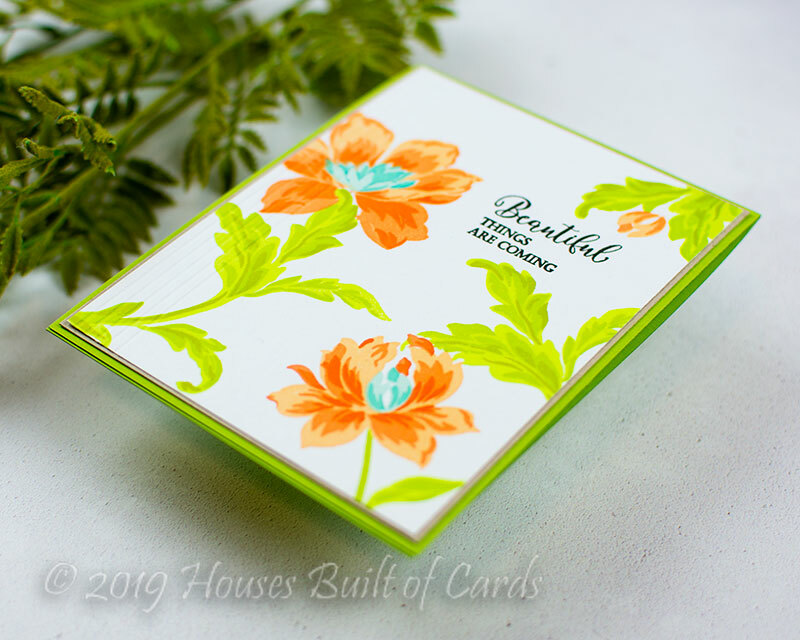 The Angelique Motifs set is one of my favorites from this release and your card using it is especially lovely Heather! Gorgeous collection of cards! Stunning compositions, colors and designs. This newest release totally KILLED my budget! I loved almost every single item! My fave from above is the 3D Garden picks. So versatile, and easy to use. 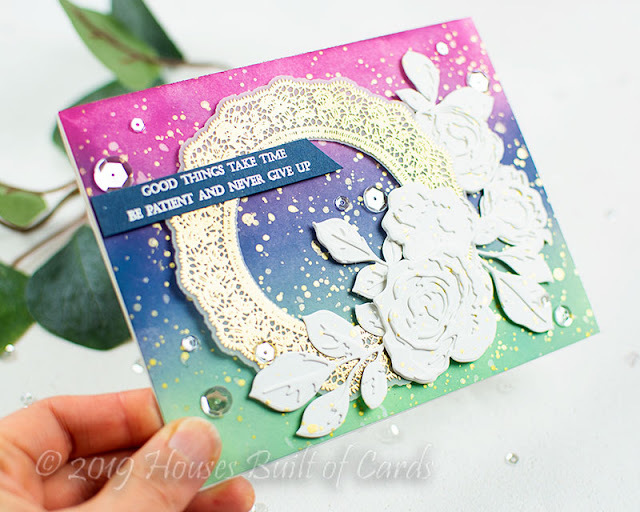 I love the way you used the solid white cardstock----I never would have thought of that, yet it is so lovely! And the Wonderland on vellum----be still my heart! Thanks for all your inspiration using so many of the newest release items! Fabulous cards, Heather! My favorite is the really colorful one using the Wonderland flowers. It's so bright and reminds me of Spring and warmer weather. 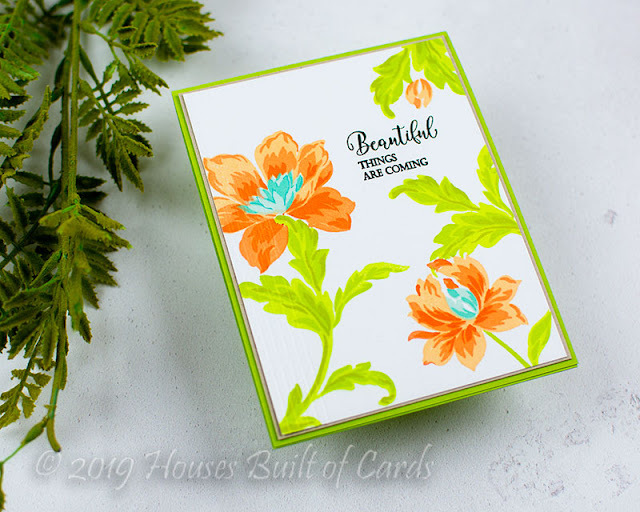 My favorites from this release include the Dainty Bouquet and the Angelique stamp sets. Gorgeous lineup of cards...wow...you have been busy. I need a little spark to get me moving in my craft room....this blog hop has been very inspirational. Thank you so much for sharing your lovely work. Beautiful cards! Love the first one. You chose great rich colors. I use press n seal to pick up my dies, too. Great invention for crafters. Thanks for sharing all this beautiful artwork. What a beautiful batch of cards! My favorite is the 3d floral! 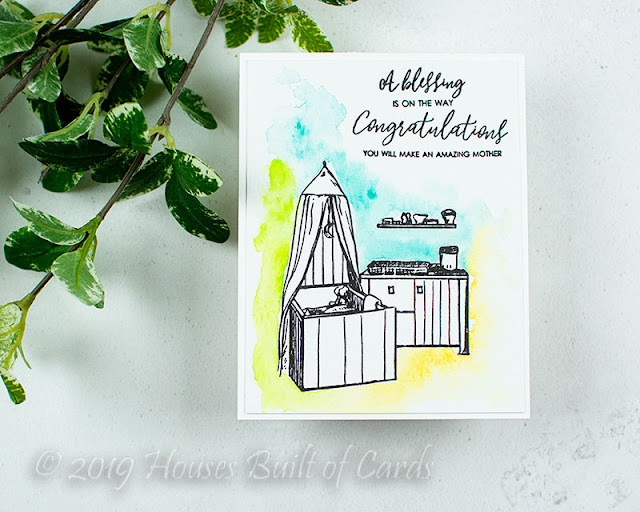 Thanks for sharing so much wonderful inspiration with these fun new products. Love the layering dies and the new beginnings the most. So many gorgeous cards, thank you sharing! 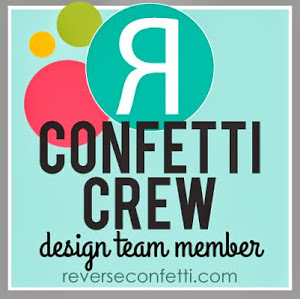 My favorite product keeps changing as I go through the blog hop and am inspired by different things. Right nosw, the wonderland stamp set tops my list because of your beautiful cards. The “Hello, Starshine” is my favorite card. I love the soft look with the bold sentiment. I love them all but the Garden Picks 3D card is my fave! Love those dies!! Heather, thank you for sharing such beautiful cards with us! I am new to card making and blogs like yours really help me learn the best techniques. I love your use of yellow in most of these cards - makes me excited for spring! I really like the first card with those pretty 3D flowers. You never cease to amaze me with what you create Heather. Always beautiful!.